Mojang are in the throes of their most dramatic community fall-out in years, thanks to an update to Minecraft’s EULA. The developers have announced their intention to enforce rules preventing players from making money in Minecraft without their express permission. While they’ve made exceptions for clear entry fees, donations and aesthetic upgrades, hosts remain worried they’ll have to ditch payment systems that keep their servers – and in some cases, their staff – online. Minecraft has an incredible online culture of minigames that Mojang ought to do their best to support. Here’s the thing, though: many of its most popular servers are run through by nagging microtransaction systems. More punitive than those found in any commercial game outside the App Store, these systems have taken root in a game adored by children. And Mojang are absolutely right to do something about that. You only need filter the Minecraft server list by popularity to find some of the worst offenders. GTA Minecraft is a cute idea that aims to make good on APB’s promise, letting players loose on city maps with gun sprites. But in this GTA, ‘cheat codes’ constitute paid-for weapons, designed to give players “that extra edge” in the streets from $5 a piece. Stretch to $50 and you can unlock higher-tier server ranks. They come with some attractive perks, like teleportation requests, the ability to keep XP on death, and server commands to find out how close other players are to your position. 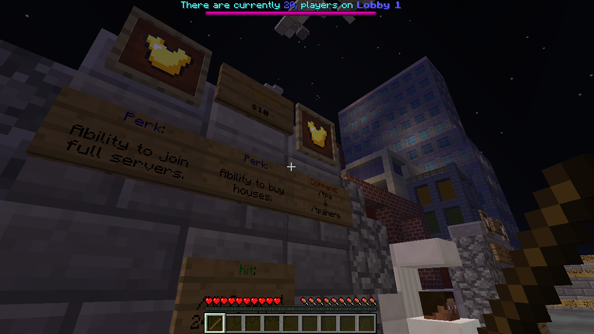 MC Central run a variety of minigames for free, but accept donations for rank upgrades. They’re named, quaintly, after Minecraft’s hierarchy of materials – coal, iron, redstone and the rest. But the hosts’ best trick is to charge for account unbannings. $20 and we forget all about your indiscretions. Mineplex is the self-described “largest Minecraft network in the world”. Even on a morning like today, when the US is asleep, it hosts upwards of 4000 players. Were it a Steam game, it’d be within the top 30 most-played. “We have been very careful to ensure that donators do not get an unfair advantage over regular players in-game,” write its hosts on their site. “We strongly oppose ‘pay2win’ and want everyone to have a fair chance. When I join their server, I’m immediately subjected to references to an in-server gem currency. Opening my ‘gadget’ inventory, I can see items that look like eggs. 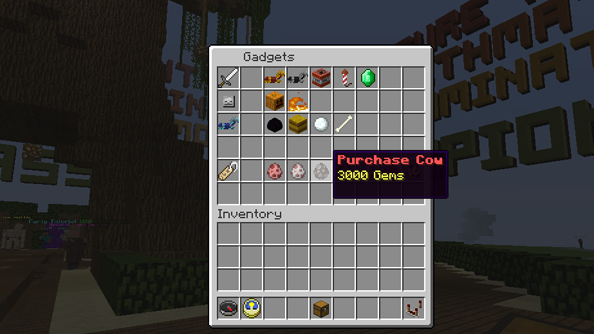 But if I hover over them, it becomes apparent that they’re actually prompts to buy pets – a pig for 3000 gems, a chicken for 4000, or perhaps a cat for 5000. 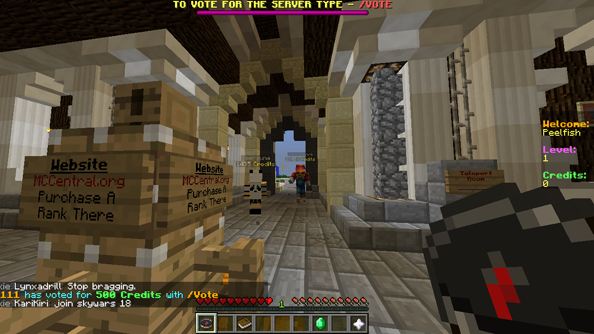 Every Mineplex player has access to a paintball gun. Equip it, and you can fire missiles which repaint portions of the map in random colours. Brilliant! But it comes attached to a capitalised warning: every shot requires two gems. My starting total of 1000 gems is depleting fast. Forever-scrolling on-screen text informs me that I currently hold no rank, and need to purchase Ultra rank on the server’s site to unlock “all game benefits!” – double gems, kits for every minigame, and the chance to apply for a staff role on the server. If you’re looking to add some new life to your Minecrafting, you should check out our twenty best Minecraft mods. “Anyone for a gem party bomb?,” asks a player with a pink ‘Hero’ prefix. He throws an item to the ground, which triggers a particle-effect laden explosion. Gems scatter in all directions, and we all drop what we’re doing, each of us after the biggest share of green, bobbing sprites. Subsequent chat is drowned in the clamour for more gem bombs, and two or three more are fired off. He drifts away, and chat dies down again. GTA 5 might be rated for adults, but it’s clear these players are barely more than children. They’re being subjected to tiered class systems far worse than those we ripped The Old Republic apart for, in a game fast occupying the same cultural space as Lego. That has to stop.